His book is an inspiring story of how one man overcame the trials of his past from Chicago’s violent West Side to develop a path to personal success, despite countless obstacles that sought to derail him. Lamont has extensive experience in supplier diversity, overseeing successful supplier diversity programs for large corporations in healthcare and media. He has been quoted in various magazines and newspapers including the Wall Street Journal. Please check out my dynamic daughter’s business and order your canvas today! https://t.co/cQQQmSP6os She can do great things with words while bringing them to life on canvas. 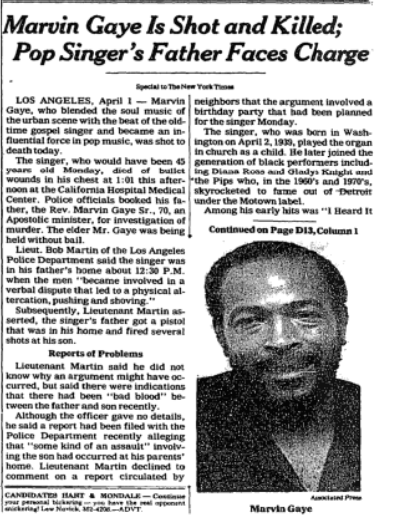 Marvin Gaye was killed today in 1984, a day short of his 45th birthday. The singer, described as "an influential force in pop music" by The Times was shot by his father. I know I’m late with this but I want to wish a Happy Valentine’s Day to my favorite and most important women in my life right now. ❤️ Daddy loves you all eternally. I’m amazed at your resilience and love. Have a question? Fill out the information and our team will respond to you as quickly as we can.